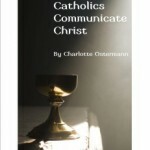 Charlotte Ostermann, a Catholic convert, is a freelance writer and editor. She is also a veteran educator, poet, homemaker, humorist, and spiritual mentor. Her newest book, “Catholics Communicate Christ: How to Serve the Catholic Church as a Writer” came out two weeks ago, and we had the pleasure to interview her about her new book and some of her inspirations! 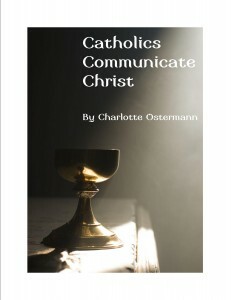 So, your Kindle Book, “Catholics Communicate Christ: How to Serve the Catholic Church as a Writer” was released on November 7, 2012. What prompted you, or inspired you, to write this book? I went to the Catholic Writers Guild LIVE Conference in August, and was profoundly grateful for all the encouragement I received. As I drove home, my heart just overflowed with the desire to share that encouragement, and some of the great practical advice, with others. I know how it feels to be very hesitant and unsure about ‘self-promotion’ as a writer who wants to give God the glory. At the conference, humble men and women, and godly priests assured us all that, if God gives the message and the skill, then we ARE honoring Him if we do everything we can to get that message into people’s hands, computers, consciousness! Something inside me opened up – I say I ‘got over myself’! As I reconsecrated myself, and my writing, to Mary in the days that followed, this booklet became a reality. How long have you been writing? And how did you get started? I’ve been writing since I was a child! I don’t know what it feels like to go through life without turning everything into words – experiencing life as narrative, wanting to share what I learn with others, turning passion into poetry. As a non-Christian, I never wrote professionally. After I became an evangelical Christian, I wanted to write – to share the Good News – but God seemed to hold me back. After I became a Catholic, I felt so glad He had caused the seed to ‘fall into the ground’ for a time. I needed to mature, to have my writing burned into my very being, to be purged of self and error as much as possible so that Christ-within-me could shine. My hubby took all the kids to Colorado for a two-week camp out fifteen years ago, and in that at-home quiet time I began to write and haven’t stopped since! One of my first Catholic venues was Canticle magazine, and Envoy published my conversion story, “A Closet Catholic Comes Out’. Since then, that writing retreat has been the annual event I most fervently look forward to! Russ, God bless him, has taken kids as young as two so I could have this amazing experience. In your Amazon biography, you mention you live on a “farm wannabe” north of Lawrence, KS. What do you mean by “farm wannabe”? I’ve never heard that phrase before. Ha! If you knew what lame ‘farmers’ we are, you’d see what I mean! We get the importance of sustainable agriculture, organic food, distributist initiative, and all that, but we are city-raised and pretty lazy gardeners, so it is truly a ‘Patchwork Farm’ (our new name for it). Most of our activities are in town, so we don’t feel like ‘real farmers,’ yet the land is here and I think it sort of hopes we’ll grow up. There’s a big garden, chickens who do actually lay eggs for us, two goats that my daughter will be milking in the spring, and some ducks we call ‘farm props’. As Chesterton said, “Angels fly because they take themselves lightly”! Why do you feel it is important to find more writers in the New Evangelization? Here’ s the huge truth: EVERY SINGLE PERSON stands at the intersection of a unique set of realities. Only he or she can fully respond to those realities, and to those people. Everything we writers are saying is already ‘out there’. None of it is original with us. We are all re-writing truths you could get from a hundred other places. But each of us is speaking for a new audience. The Gospel hasn’t been realized fully until it is realized, re-presented, made real through each of us. If you deal in words, you MUST get the truth of what God has done for you into words!! Some writers are going to be true ‘artists’, but many, many more will simply be human beings – ordered to words not necessarily because we are artists with words, but because we are humans created in the image of the Word. The use of words is a critically important skill in the New Evangelization because it is, in itself, a recapitulation of the human person! You mention that our words can help “stem the tide of destruction”. How do you, as a writer yourself, stay motivated to continue writing and spreading God’s word? Well, I think of the architect Gaudi, in his last years, working on the Sagrada Familia. He was asked a similar question and said that if he did not create, did not do this work, he would die. I feel the same way. I simply do not know how I would live without shouting about the hope that is in me, the joy that overflows from me, and the destiny that is mine and yours and everyone else’s!! You mention the Catholic Writers Guild. How has the Guild helped you develop as a writer? Frankly, the Guild hasn’t helped me develop as a writer so much as helped me feel I am in a community of people who understand this Thing I Do! In the ‘real world’ of daily life, there are not a lot of people who understand the drive to be creative, to give oneself with abandonment, to do work that is essentially lonely because of a love for people. People misunderstand and reinforce our own hesitations and inhibitions. They hurt us and that’s a challenge to deal with, because we have to stay vulnerable to keep giving. In the Guild, we have others who understand the various struggles of the writing life, and who can help us stay the course. Since it is solidly Catholic, we don’t have the different issues that come up among fellow writers who understand writing, but have no comprehension of what we go through when writing is a religious kind of vocation. Below is a podcast we recorded for My Catholic Blog in December 2010 with Jerry Weber, host of The Catholic Revolver. Jerry discusses all things Catholic. Guests will often be invited to participate on the show. Whether they have a conversion story to share, an inspiring life story, or just have a great passion for Catholicism in general, they will be the heart of the show. The Catholic Revolver will also at times branch out to other topics such as Pro-Life issues, Conservative Politics, Health & Well-Being, Music, etc. One thing is for sure though, the show revolves around Catholicism and will always return to discussing the beautiful Catholic Church one way or another.